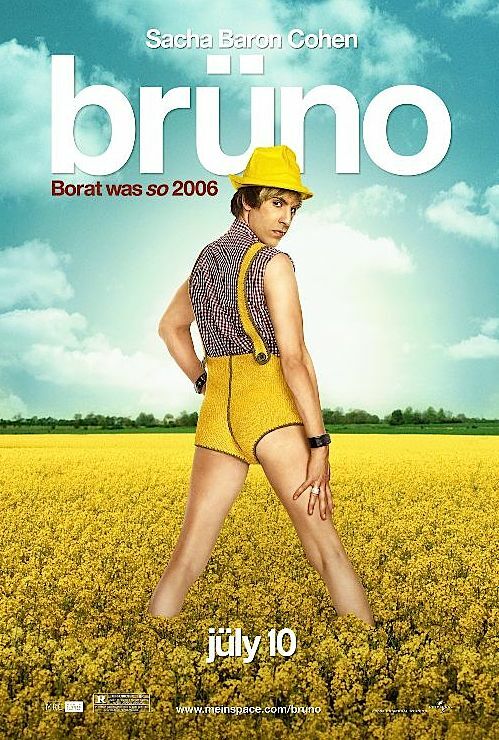 When looking at Bruno, it’s obviously apparent you have to look at Cohen’s definable characters and his last film – Borat (2006), which although is not a prequel to Bruno, gives a good idea of what to expect within his boundaries of comedy. Question is: how could Cohen go overboard on what was deemed risqué last time round? Well here it is – Bruno is a Austrian homosexual fashion guru, who believes his cause in life is to become famous by literally any means necessary – which is tried out in various ways throughout the film – for example, when Bruno thinks it’s a good idea to get kidnapped by real life terrorists – how Cohen got out of this one having filmed in the Middle East I’ll have no idea. Should celebrities be allowed to adopt children? Why are certain people celebrities and not others? Is a cardboard box a really good way to transport a baby? In my opinion, this film is definitely above the level of Borat. I thoroughly enjoyed the film as for me, it pushed more boundaries in terms of film-making than last time. If you’re one of those people who are easily offended, it’s really not the film for you. But if you’re willing to keep an open mind, it’s highly amusing.